Uzes has a history of being a tolerant and open community. 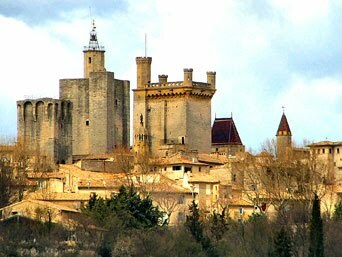 In the Middle Ages, civilised Uzes was a stark contrast to Northern France, which was ruled by the Franks. In the Christian World during the Middle Ages, Jews generally lived outside the feudal system and their rights were very limited. Although the Languedoc wasn’t a Utopia, it was much more tolerant towards the Jewish population than other areas in Europe. For example, at Easter, there was a popular christian tradition called “Strike the Jew”, however this was outlawed in the Languedoc. Jews began to settle in Uzes from the 5th century and the bishop of Uzes invited them to dinners and became friends with many Jewish people. Although he did dedicate quite a bit of energy to convincing Jews in Uzes to convert to Christianity, it was not an aggressive pursuit. Unfortunately, his friendliness was noticed and reported to King Childebert I, who was not quite as tolerant. The Bishop was ordered to compel the Jews in his community to convert – and if they refused, they were to be expelled from the town altogether. After his death, many Jews that had been baptised decided to return to Judaism. By the 13th century, Uzes became known for its community of wise Jewish scholars, and also housed a community of Cathars, a gnostic religious sect. It also was known for being one of the largest Protestant cities in France – a somewhat dangerous position in a strongly catholic country. During the religious wars of the Reformation in the 16th century, the city suffered for its religious stance, and all its churches were destroyed. So Uzes has had a history of open-mindedness, generally making its own decisions and not simply following popular trend. When the French Revolution came, the Ducal family went into exile – being close to the Royal family, they weren’t too popular during this time. However, the family got some of their property back under the Restoration and the family still owns the colourful chateau in the middle of the town — this chateau has remained the residence of the family for over a thousand years. 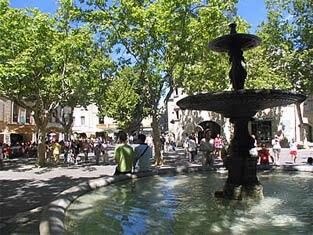 Uzes really came into its own in the 16th century, when it established itself as a major player in the textile industry. The town produced silk, stockings and woollen cloth with over 2,000 people being employed in textile factories in Uzes. The affluence of the town suffered with the introduction of the railway, however – suddenly the town had to compete with far away markets, which had a more competitive edge and sold their goods more cheaply. Uzes couldn’t compete against this new influx of goods, and so business began to decline. With money suddenly not being so abundant, fewer houses were built, so the effect is that Uzes is frozen in time, with more of the Medieval architecture having been preserved. When the town became more prosperous around the 19th century, building boomed again – so we have this architectural contrast in Uzes, between the older medieval styles and the newer, grandiose 19th century styles.